Geographically, Finland lies in an intermediate climate zone between maritime and continental zone, with its largest part in the boreal vegetation zone. 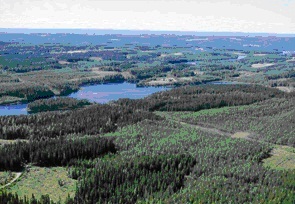 As Finland is over 1,100 km long on the north-south axis, conditions for forest growth vary considerably between the southern and northern parts of the country. Forest is Finland’s most significant renewable natural resource. Finland’s forests are managed in a sustainable way. The basic objective of sustainable forest management is to ensure the continuity and profitability of wood production and at the same time care for the biological diversity of forests and forest products and services. Forest cover in Finland is more extensive than in any other European country. Over 86% of the land area is forested. Of the total forest area in Finland, 71% is under private ownership (including forests belonging to the Finnish forest industry companies, municipality, parish). The Finnish State owns 29%. 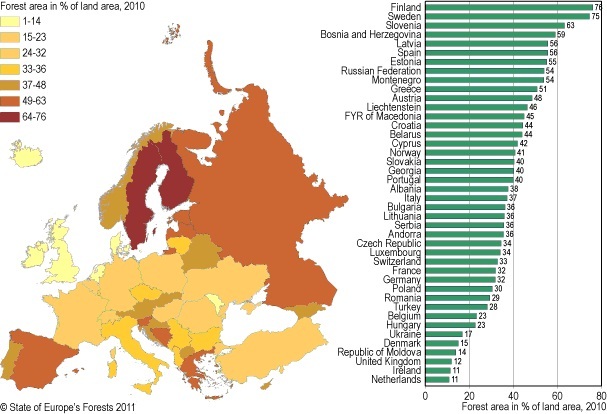 Forest cover in Europe, as percentage of land area. Source: Forest Europe 2011. Finnish forest and water landscape. Photo: Metla/Erkki Oksanen. Towards the north, the climate gets increasingly colder and more humid. The annual growth period in southern Finland is about five months whereas in the north it is three months. The growing stock volume in Finland amounts to 2,284 million m3. The average increment of growing stock in Finland is about 5 m³/ha/year. The annual increment of the growing stock in Finland is over 103 million m3. Half of the growing stock consists of Scots pine, 30% of Norway spruce, and 20% of broadleaved species (mainly birch). 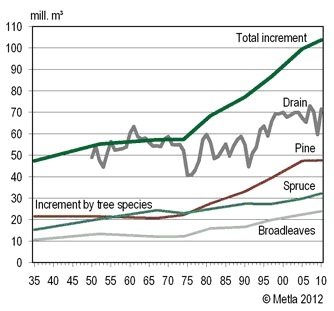 Annual increment of growing stock (1935–2010) and annual drain (1950–2010). Sources: Finnish Forest Research Institute (Metla), National Forest Inventory and Forest Statistics Information Service.